We discovered this guy who does specially handcrafted Aghan and silver jewellery for all the junk diggers out there. And he is seriously affordable. Lately, the streets have been full of Afghani jewellery with people swooning over the unique designs and colourful cut-stonework and mirrorwork. If you are a fan too and are looking for some affordable and customised pieces, we suggest you head to this open-air mobile stall in Dakshinapan. Here a rather reclusive fellow (which is why he isn’t in the pictures here) sits with his pandora’s box of jewellery. It’s opposite Dipti, the saree store (shop no.50) and just beside Malti jewellers (shop no. 53). 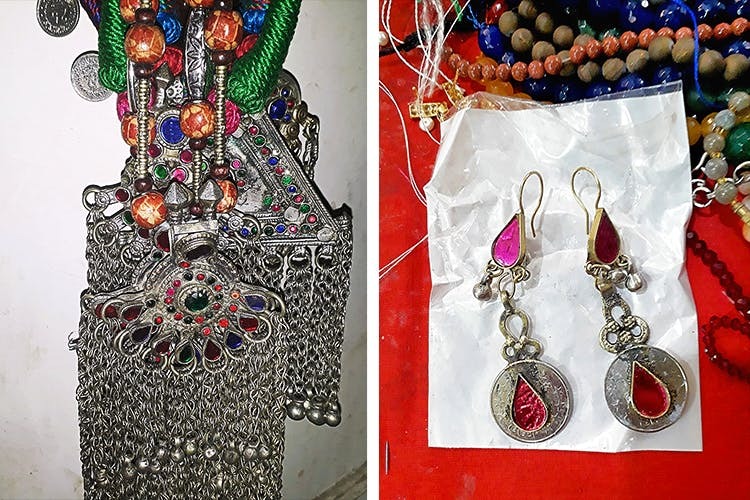 He has a bagful of colourful chandbalis and dangler earrings, starting from around INR 800. He always has something new coming in, like heavy chokers and kamarbandhs. The best part? He will customise some of the stuff - for instance, the chain for the pendants. Also, he handcrafts his chains and tassels. So you will find some unique designs here. His stall does not have a name. So you may have to look around a bit. Enquire at the adjacent shops. Do check out his specialty — the large pendants starting from INR 1,500 and smaller ones from INR 1,000 to INR 1,200. He is open to bargaining.